1947 and estimated to be from around 500 BC till about 200 AD. In 1943 during mining near the village of Nok (hence the name), in Nigeria, Bernard Fagg, William Fagg’s brother, did much of the early work on these discoveries. 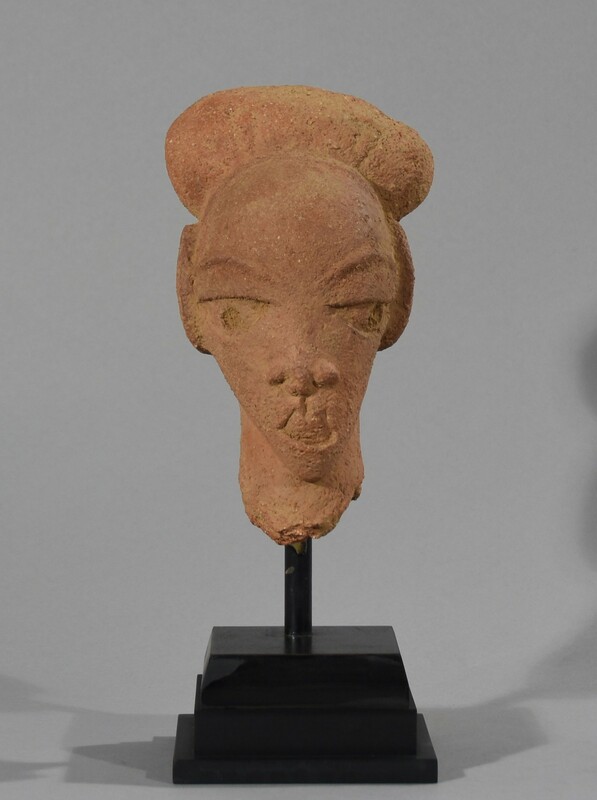 Nok culture, named after the village on the Jos plateu in Nigeria where it was first discovered in 1929, is the earliest known terracotta tradition in sub-Saharan Africa. 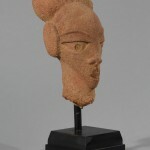 Notice the featrures of this decorative Nok head: it is characterized by its slanted, drilled walleyes under arched eyebrows (which are often seen in later cultures such as the Yoruba), a wide-lipped mouth and a snub, broad and flat nose (the majority have more aquiline or elongated noses). The ears are covered by its coiffure, a kind of sideburns. The head is mounted on a custom-made stand. 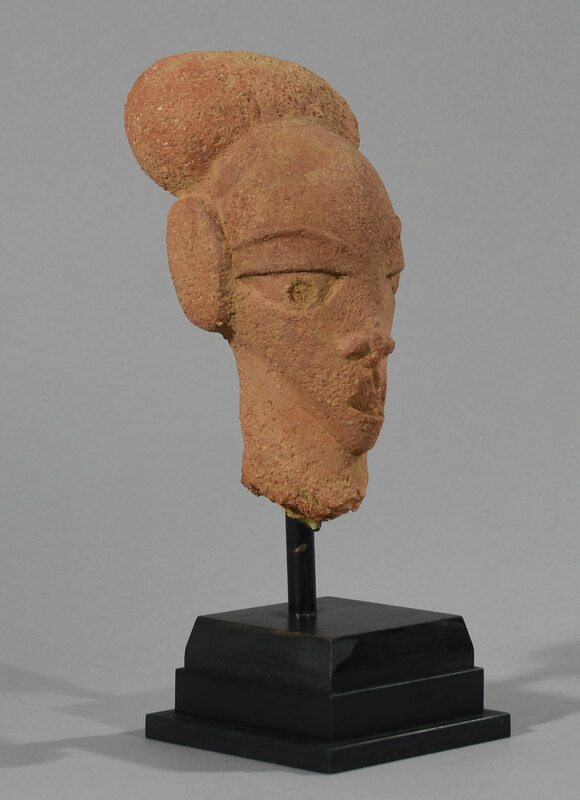 The earliest identified Nigerian culture is the Nok culture, which thrived between 1500 BC and 200 AD on the Jos Plateau in northeastern Nigeria (classical Nok period dates 500 BC to 200AD). Information is lacking from the first millennium BC following the Nok ascendancy. However, by the second millennium BC, active trade routes developed from Ancient Egypt via Nubia through the Sahara to the forest. Savanna’s peoples acted as intermediaries in exchanges of various goods. Reasons for the Nok’s sudden disappearance remaines unknown. Source: Boundless. 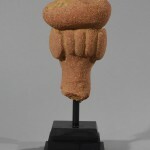 Sculpture of the Nok. Boundless Art History. 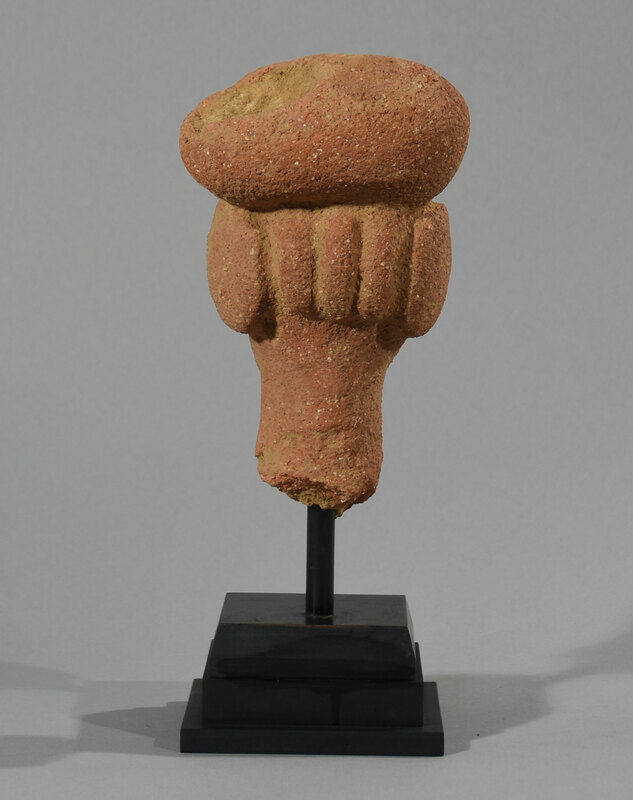 Nok head fragments were once part of entire bodies and each object are so highly varied that it is likely they were modeled individually rather than cast from molds. Although terracottas are usually formed using additive techniques, many Nok pieces were sculpted subtractively in a manner similar to carving. This distinctive approach suggests that a comparable wood-carving tradition may have influenced them. 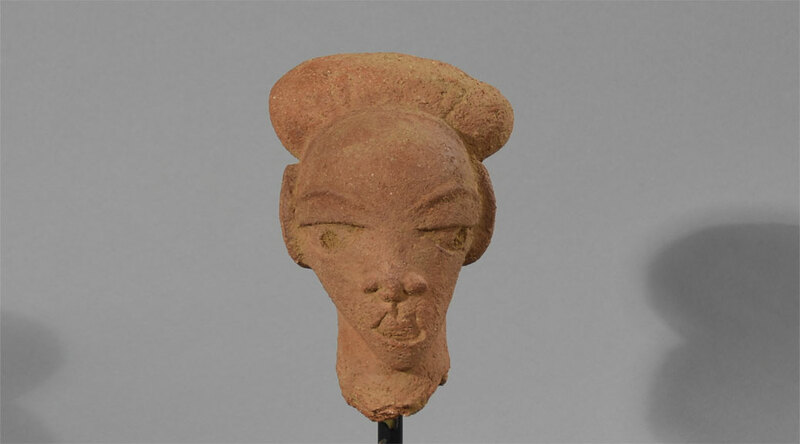 The heads of Nok terracottas are invariably proportionally large relative to the bodies, and while not enough is known of Nok culture to explain this apparent imbalance, it is interesting to note that a similar emphasis of the head in later African art traditions often signifies respect for intelligence. Although every Nok head is unique, certain stylistic traits are found throughout the corpus of known work. Triangular eyes and perforated pupils, noses, mouths, and ears combine to depict men and women with bold, abstract features. Perhaps the most striking aspects of Nok sculptures are the elaborately detailed hairstyles and jewelry that adorn many of the figures. The variety, inventiveness, and beauty of their design is a beguiling record of cultivated devotion to body ornamentation. But as captivating as these embellishments are, the range of expression in Nok terracottas is far from limited to depictions of idealized health and beauty. Some pottery figures appear to depict subjects suffering from ailments such as elephantiasis and facial paralysis. These “diseased” visages may have been intended to protect against illness but beyond conjecture, their meaning and the significance of Nok sculpture in general remains unknown. The great sophistication of Nok terracottas has led some scholars to believe that an older, as yet undiscovered tradition must have preceded Nok terracotta arts. 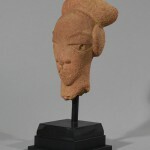 It has also been suggested that Nok terracottas have some sort of relationship to later portrait arts, such as those of Ife, but this is currently unproven. 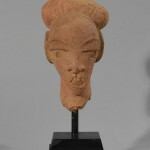 Nok terracottas currently occupy an important but isolated space in the history of African art. 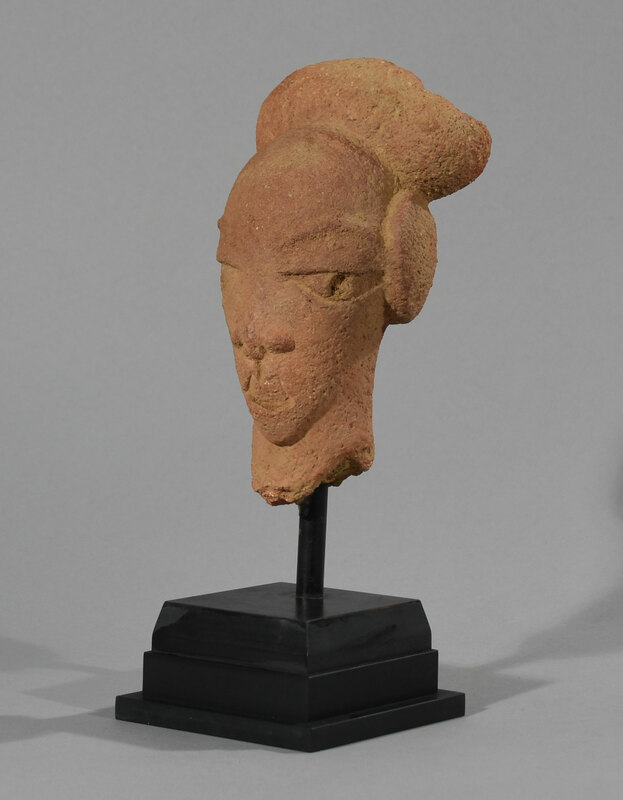 One of the earliest African centers of ironworking and terracotta figure production, the Nok culture remains an enigma. Provenance: Found in situ in 1947 and kept in a private Belgian collector’s collection since then.